Their first studio was a shed where electricity and water were intermittent and distractions included the noise of children playing outside, women doing their laundry, dogs barking and a cat chasing rats across the roof. ?We said we'd do it for fun,? says singer Tsedenia Gebremarkos. ?We sang and did crazy stuff. We weren't expecting anything to happen. We were just excited that somebody from Europe was interested in our music.? After a week, the sessions finished and Nick left. ?He said he would make something happen,? remembers Samuel Yerga, a 20-year-old piano prodigy. ?But he did tell us it might be a long time. We just asked him not to forget us.? ?I'd been happy with the initial album,? says Page, ?but when Real World talked about releasing it, they wanted to know if we could record some new stuff for B&W.? Two years later, in the spring of 2008, most of the musicians regrouped in the west of England to work up some new songs and put finishing touches to those recorded in the shed. ?The cost would have been prohibitive without B&W,? says Page. ?Nobody, apart from boybands and young girls, sees any sort of budget now in the music industry. 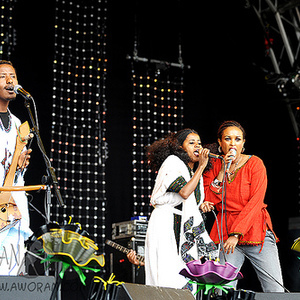 Because of B&W's involvement, however, the musicians were brought over from Ethiopia, paid a fee and got to work in the sort of studio that doesn't exist there. Real World asked if I'd mind, but I'm really glad to get the chance to do this. For a lot of reasons. Visas and work permits could be arranged, we can even think about the possibility of live work, of playing the Barbican and Glastonbury. I'll go for anything that helps. And now we can make the strangest record we can without anybody throwing us out.? Strange? There are traditional flutes, harps and one-string violins in among the more familiar dub effects, the saxophone that hints back to the golden era of Ethiopian pop music and the eerie organ that seems to ghost in from the Caribbean. ?Most musicians in Ethiopia don't have any instruments,? says Yirga, stepping away briefly from the piano he has been playing all week. ?We just can't afford them. So our musical culture is under attack from inside and out: it's all hip-hop groups and pop singers, and nobody can afford to run a big band with musicians. But Dub Colossus gave us something new yet still unmistakably Ethiopian that we could work towards. ?